During Texas Rising Stars on March 26 at 7:30 p.m., the Austin Civic Orchestra will accompany the two winners of the Butler School of Music’s String Concerto Competition. Read the artists’ bios below and join us for the performance! 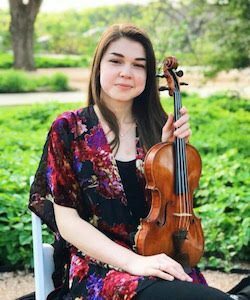 Sara Melissa Aldana is a junior at the University of Texas and is pursuing a degree in violin performance through the Butler School of Music. A native of Bogota, Colombia, Sara spent four years as concertmaster of the Youth Orchestra of the National University of Colombia and toured Spain with the National University of Colombia Orchestra. She performed as a member of the Bogota Foundation Symphony Orchestra, the Bogota Youth Chamber Philharmonic Orchestra, and the Clara Schumann Women’s Orchestra. In 2017, Sara won the Concerto Competition at the Butler School of Music, giving her the opportunity to perform the Barber Violin Concerto with the University of Texas Symphony Orchestra. In 2010, she won the Luis Angel Arango Library’s Youth Performer National Competition in Colombia. She was awarded the Codabow Prize in the Mary West Solo Competition in 2014. The following year, she won Grand Prize and First Place Senior Division at the Mankato Symphony Orchestra Young Artist Competition and Honorable Mention at Thursday Musical Competition. In 2016, Sara was named as a finalist for both the Schubert Club and Schmidbauer Young Artist competitions. Throughout her career, Sara has been awarded full scholarships to attend summer music festivals including the Kent/Blossom Music Festival (2016 and 2017), Bravo! Summer String and Keyboard Institute at the University of Minnesota (2014 and 2015), Cartagena Music Festival in Colombia (2014), Sewanee Summer Music Festival at the University of the South (2013), Santa Catarina Music Festival in Brazil (2013), Campos do Jordao International Music Festival in Brazil (2012), and the first Meeting of Latin American Suzuki Students in Peru (2010). As the recipient of the Starling Distinguished Violinist Scholarship, Sara is a student of UT professor Brian Lewis. She studied with Sally O’Reilly as part of the Pre-Conservatory Program at Shattuck-St. Mary’s School, Liz Angela Garcia at the National University of Colombia, and Marcelino Prats at the National University of Colombia. Sara plays on a violin graciously loaned by the Virtu Foundation. 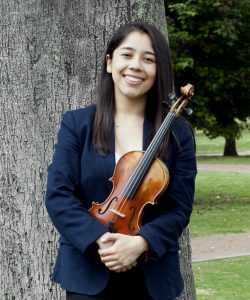 Corina Santos is a violinist and music educator from Austin, Texas, who is currently completing her final year of undergraduate study under professor Sandy Yamamoto at the University of Texas. Recently, she completed a yearlong intensive study and teaching assistantship in the San Francisco Bay Area with violinist Elbert Tsai. During this time, she was also appointed a teaching artist at Music Mission San Francisco, a nonprofit music education program serving primarily young Latinx musicians. Corina held the position of assistant principal second violin with the University of Texas Symphony Orchestra and principal second violin with the Butler Opera Center. She has also performed as a substitute with the Round Rock and Temple Symphony Orchestras. During her undergraduate career, Corina worked with acclaimed violinists and teachers such as David Kim, Laurie Smukler, Danielle Belen, Sally O’Reilly, Susie Park, pianist Rohan de Silva, and members of the Miró Quartet. An avid teacher, she served on the faculty of the Music Mission San Francisco and the University of Texas String Project, teaching early childhood music, theory, orchestra sectionals, and group and private violin lessons. Corina’s passion for teaching comes from the belief that students learn best when they are supported, encouraged, and challenged, and she strives to provide experiences for her students that bring them joy. In her free time, Corina enjoys dancing cumbia and salsa, listening to podcasts, and the occasional Netflix binge. This concert will serve as Corina’s solo debut with the Austin Civic Orchestra, and she is thrilled to be sharing the stage with the orchestra and her dear friend, Sara Aldana.